Hal Tenny said that in a comment here on Orbit Trap recently. After my recent posting, Renderfeast, which featured an number of Deviant Art folks (DAers) I saw people on Fractalforums.com remarking that they had been featured on Orbit Trap. I didn’t recognize their FFs usernames from DA. Hal Tenny is right though, much of what appears in the FFs gallery uploads section also appears on DA. I should have noticed this myself and probably would have if it wasn’t for the aversion I have acquired over the years to the big online art sites like DA and Renderosity, Flickr, and just about anywhere else you can find easy upload access and instant social interaction. Places like that just get swamped with mediocre stuff and it’s tiresome to wade through it all looking for a few good ones. But I don’t seem to mind it so much anymore. Maybe I’m more patient or maybe I’ve just come to accept the fact that digital art in general is like that and that places like DA are more like “refrigerators” to stick stuff up on than they are serious art galleries. The Linux world often complains there’s too many versions of Linux and that that confuses and distracts too many newcomers from the really good ones. I just see it as the expected result of removing restrictions to innovation and creativity; it will never be any other way. We sort through things everyday when we’re shopping or reading the news. Should online artwork be any different? Who really wants less choices and fewer options? Maybe the chaff makes the wheat look better? What sets the gallery section of FFs apart is that there’s very little “fiber” to sift through. Most of the FFs artists seem to have a home gallery on DA. This is not so surprising really, since FFs has always been primarily a “fractal” site and not a fractal art site. DA on the other hand is clearly a place where the graphical side of things is the main attraction. It has the atmosphere of a flea market but that’s just the nature of online digital art. I found it by browsing DA on the search term, “Fractal” and selecting “Newest”. Instead of newest you can browse by “Popular” but that’s the kind of thing I always avoid on these BOAS (big online art sites). Popular is “too subjective”, let’s say. How else can you quickly find fractal artwork like aparks45’s up there? You won’t find it traveling on “Popular Street”. Now some of you may be thinking, “That’s a good reason to stay on Popular Street” but I’m of the opinion that there’s always something better out there “in the wild”. I’ve discovered that there’s actually a separate fractal art section on DA with three subsections (go ahead and laugh). You have to click on the “Digital Art” link in the left sidebar on the main DA page which then expands into the sub-categories of which Fractal Art is one. It’s not as obvious as it ought to be, but I’ve always suspected that BOAS were designed to be member-friendly and not visitor-friendly. Members are where the money (if any) comes from. On the other hand, big sites like this are always a challenge to navigate because they’ve got such a wide variety of stuff on them. Categorizing artwork is an art in itself. These next two aren’t fractal, but I discovered them after getting off the main road and exploring aparks45’s own gallery. I just love the way Santa catapults across the sky like he was shot out of a slingshot. Negative criticism? 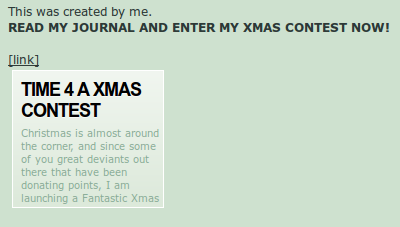 On Deviant Art? Well, maybe SquallLion1 is an exceptional member of DA. I don’t ever remember seeing such honesty on a BOAS like this except when it came to criticizing Orbit Trap for its criticism. But I find it as fresh and energetic as these animated gifs by aparks45. While sailing between Scylla and Charybdis on my DA odyssey I’ve gained new insight into a place like Deviant Art as well as fractal art and computer/digital art in general. This image really has some style to it. Maybe it’s the gif palette that forces aparks45 (Amy Parks ? who owns a 45?) to step into the retro color world of 256, 8-bit color with it’s special dithering tricks that has been all but forgotten in today’s fractal art world of millions and millions of colors. The lake effect is actually drawing something new instead of being just a cheap digital way of imitating a natural phenomenon. You need to see the full size to really appreciate this one, although it’s not bad as a thumbnail. The “Jupiter” up in the top left is a nice touch. When was the last time you ever saw real color like this? Well, I said it was an odyssey and just like Ulysses, it’s time for me to set sail once again. I’ve genuinely enjoyed browsing aparks45’s animate gif gallery. I know it’s not the sort of fractal art or digital art most Orbit Trap readers are used to looking at or expecting to see reviewed, but if fractals are anything they’re a place of surprising wonders and the realm of the eccentric. I like eccentric things. Maybe eccentricity is what art is all about. One thing I’ll say in closing; doing what everyone else is doing is a waste of time. And no fun either.